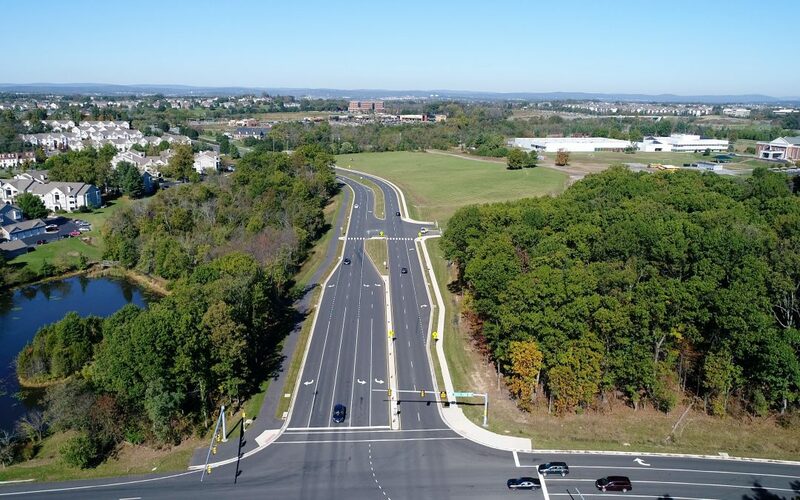 Russell Branch Parkway; Loudoun County, Virginia - Rinker Design Associates, P.C. Rinker Design Associates, P.C. was awarded the design of approximately 1,300 linear feet of new roadway design. Russell Branch Parkway is an urban four-lane divided roadway which parallels Route 7 and provides overflow relief for traffic congestion as well as interconnectivity. The project scope included topographical survey, dry utility surveys, records research, environmental designation, environmental permits, drainage, detailed hydrology/hydraulics, acquisition plats, signal design, and roadway design alternatives analysis and recommendations. The project also required coordination and integration of adjacent developer design and input. Additionally, a floodplain analysis was prepared to evaluate and mitigate for the impacts of the roadway to the Russell Branch tributary. Due to the floodplain limits, alternative means of stormwater management for quality and quantity were investigated with the likely approach to include use of a developer facility located at the convergence of the tributary and Ashburn Village Boulevard. In addition to the design of Russell Branch Parkway, Ashburn Road was analyzed for lane capacity and configuration. Although this roadway project is on a new location, it provided challenges such as addressing adjacent owner concerns. Property owners included a developer, a church, and a residential development and condominium.